China has just announced a 10% cut on the electronics goods import tax which is a U-turn on the events of last year that left Hong Kong Apple fanboys crying in the corner. Have you tried to buy an iPad 3G or an iPhone 4 recently? Unless you ordered online (where one requires a credit card, a local address and is limited to 2 per person) your buying efforts were probably fruitless because it seems our neighbors across the border have been clearing the stock out of our poor little retail outlets (evidence: ask any local electronics store salesperson, or watch this video of two young ladies stuffing an entire box of iPhones into their bags on the KCR). Why the fascination with these specific Hong Kong goods? Well, apart from them being better and wholly superior, it’s because the iPad 3G is banned in China, because Apple wares are sold tax-free in Hong Kong (a saving of RMB $724 on the iPhone 4) and because Apple can’t make the iPhone 4 quick enough to deal with the feverish demand of those mainlanders. Things eased up temporarily back in October last year when Chinese customs started strictly imposing a 20% import tax duty on iPhones and iPads (in addition to the 20-category list featuring other common money-makers such as alcohol and tobacco). 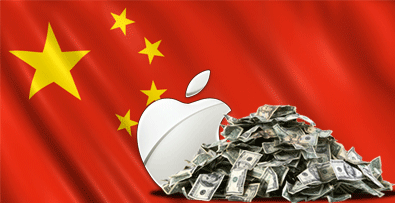 Although the regulations were issued years ago, they were not exactly enforced until October (which was coincidentally around the same time that the Apple fever reached a frenzy in China when the official mobile carrier sold 100,000 iPhone 4’s four days after its launch and when one official Beijing Apple store had to be temporarily closed down to change a policy to deal with iPhone 4 resellers there and then. A bit of background – reselling fresh Apple goods on the gray market is a super-easy way to make a quick buck in China (read a comprehensive guide on the local iPhone 4 market here) and the illegal peddling has reached such an extent that a group of 14 housewives were even caught smuggling 85 iPads and 340 mobile phones into Shenzhen (one of them had 65 phones attached to her waist, and approximately another 20 in her handbag – that’s a lot of Apples). But the latest news really takes the apple biscuit, because last week – less than 3 months since the tax had begun to be more strictly enforced – authorities had a change of heart. In a typical one-step-forward/two-step-backwards approach, China’s Ministry of Finance reversed their 20% tax law and officially declared a 10% reduction of import tariffs on computers, digital cameras, and other electronic equipment which has been in effect since January 27 (one wonders if the recent meeting between Obama and Hu Jintao has anything to do with this). In addition, Apple also just opened their latest store in Beijing a few days ago which, as usual, drew in a crowd of eager fanatics. Frankly, we can’t understand what all the iFrenzy is about – here at the TDS underground headquarters we have a few crummy iPhones which are pretty pathetic, and besides, the majority of positive press reports about Apple and their far-from-perfect iThingies are influenced by newspapers and TV networks that simply want to profit from the hype – or even worse, reporters who are looking to sell books about the iPhone. this post. I can be coming back to your weblog for more soon.